A new device allows the non - destructive inspection of standing trees for cracks, cavities, and rot. It is based on the simultaneous measurement of the time of transmission of stress waves by several sensors arranged around the stem. The system was extensively tested by comparison of the tomogram with either the cross - section of the tree cut after the measurement, or with data from penetrometers or increment cores obtained in the same plane. The border of cavities is identified to the nearest cm, whereas the with of cracks in the tomogram depends on the position of the sensors around the stem. Rots are identified as soon as the wood is sufficiently deteriorated to reduce the velocity of sound. This system may become a valuable tool for hazard tree inspection, evaluation, and management. As the urban population increases, trees in parks and along streets become ever more important for the quality of life in our cities. Old trees are a cornerstone for urban landscapes and a valuable cultural heritage. Trees with defects in their trunks and roots, however, can pose a severe risk to human life and property. As not only the frequency of defects, but also the esthetical and ecological value of a tree increases dramatically with age, it is of utmost importance to identify the extent of damages exactly in order to conserve the tree as long as safely possible. Today, defects in the tree trunk are quantified either by extracting cores with an increment borer, or by resistance to penetration measurements with penetrometers. Both techniques wound the trees, leaving canals 2 to 20 mm wide for fungal infections. In contrast to these existing technologies, the device presented here yields 2 - dimensional representations of the trunk, is (almost) non - destructive, and can be used in day to day practise. 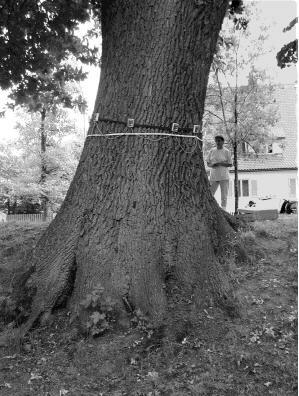 Fig 1: Operation of the system on an old oak tree (c. 185 cm diameter). The device is based on the measurement of times of transmission of stress waves. The system consists of an open - ended chain of 4 to 32 sensors. This array of sensors is arranged around the trunk to allow fast measurements of a large number of data. The stress waves are induced by hitting every sensor in turn with a small hammer. While one sensor is hit, the others make simultaneous measurements of time of transmission. The measurement process is controlled by a palm - size PC. The entire equipment fits into a suitcase, which is easily carried to the inspected tree. 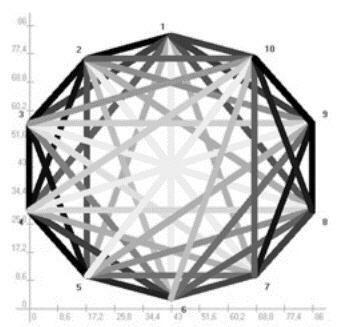 After recording the geometry of the tree - in most cases, the largest and smallest diameter are sufficient - the sensors are arranged around the tree with a belt. Usually they are installed in one plane and equally spaced to speed the operation. The sensors are fastened on small pins, which are placed on the wood. Then every sensor is hit once with a small hammer. The data are recorded by a pocket PC, which transfers them to a notebook or desktop computer, where the tomogram is computed. The entire operation takes from 15 to 45 minutes, depending on the complexity of the trunk. Fig 2: Distribution of sound velocities across a sessile oak. 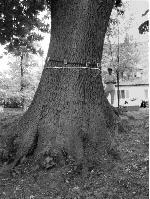 Operation of the system on an old oak tree (c. 185 cm diameter). From the position of the sensors and the times of sound transmission, apparent sound velocities are estimated (Fig. 2). To enable the easy interpretation of the complex patterns of velocities, a full colour tomogram is constructed from these data. Sound wood is represented in brown colours, deteriorated wood in red, and cavities are depicted blue. The system was extensively tested by comparison of the tomogram with either the cross - section of the cut tree, or with data from penetrometers or increment cores. In the cases of open or closed cavities, the accuracy of the measurements was compared against either a cross - section of the trunk in the same plane, or multiple measurements with commercially available penetrometers. Rots and cracks were checked against cross - sections. We tested the device in most of the important urban tree species of central Europe, including oaks, maples, linden, elm, beech, birch, willows, poplars, horse - chestnut, and robinia. The trees ranged from 60 to 600 cm in circumference. Cavities of sufficient size (approximately 1/10 of diameter) are depicted as blue areas. In most cases, the edge of the cavity is identified to the nearest cm (Fig.3). The width of cracks in the tomogram depends very much on the location of the sensors. The crack is shown as wide as the nearest sensors are spaced apart (Fig. 4). 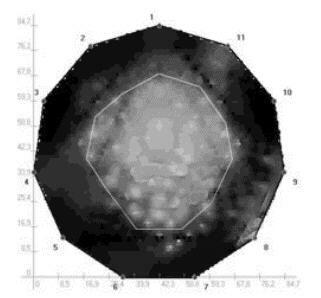 Fig 3: Black and white tomogram of a sessile oak (c. 185 cm diameter). 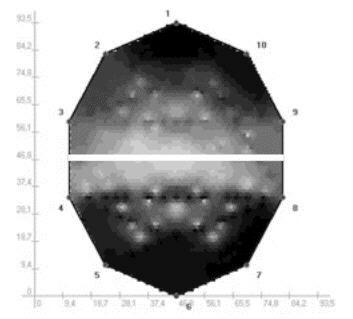 Fig 4: Tomogram of a tree with a crack. Position of crack indicated by white line. 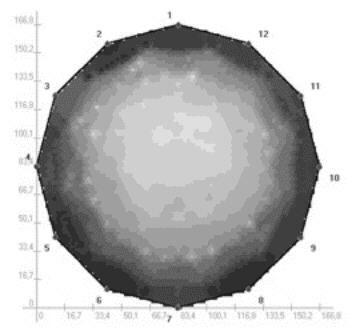 Fig 5: Black and white tomogram of a red oak (c. 85 cm diameter). The white line shows the borders of a rot as identified with 11 penetrometer measurements. The largest potential source of error in the measurement are inaccuracies in the position of the sensors. In field conditions, these errors are in the range of 0.5cm. When sensors are densely spaced, e. g. 10cm apart, this results in an error of up to 5% in the distance used to calculate apparent sound velocity. Therefor, the minimum distance between sensors is set to 10cm. The systems has, however, shown to be very robust, in that an approximation of the geometry of the plane of measurement by its largest and smallest diameter results in tomograms with sufficient accuracy for practical applications in hazard tree assessment. Using stress waves requires a good contact between the sensors and the wood. Therefor, we drive pins through the bark onto the outermost layer of the wood. This could be considered destructive, although in most cases the pin holes are indiscernible after extraction of the pin. Moreover, investigations like this are restricted to trees identified as hazard trees by indicators like wound, fruit bodies, or dead branches. In relation to these damages, 10 pin holes in the bark can be justified. The handling of is sufficiently convenient to allow measurements while climbing in the crown of trees. The operation can be learned within a period of hours, although the interpretation of the tomograms requires some training. More tests are needed (and under way) to specify the accuracy of the tomograms statistically. Further investigations are required to identify the limits of the system for the detection of rots caused by specific fungi. This system may become a valuable tool for hazard tree inspection, evaluation, and management.